Although having one or two stand-out flavors is definitely a good thing, considering how good e-juice vendors overall offerings are is very useful when you’re thinking about placing an order. A vendor might not have any of the best individual juices, but they still put out consistent quality, have great customer service and generally earn themselves legions of happy customers. Arguably, the best e-juice vendors deserve praise even more than any of the other companies we depend on, because ultimately all our hardware is intended to help us enjoy our e-liquid more. It’s literally the fuel for our vaping experience. So we conducted a poll to find out the best e-juice brands for this year, and we’re compiling the top 20 based on the results here so you can find out the best places to pick up e-liquid according to the vaping community. Our poll of the best e-liquid vendors received considerably more votes than any of the others we ran, racking up 35,792 votes at the last count. We counted up for the top 10 on October 1st, when the poll first closed, but we decided that more than just 10 e-liquid brands deserved to be featured in this post, so we recounted the votes (including any received since October 1st ) on the 4th to produce a top 20. Don’t worry, though – the top three vendors are all in the same order, and in fact, only one of the original top 10 vendors slipped out, and even then it was just to 11th place. Plus, although the order is still important, and we’ve done our best to make this poll as reliable as it can be, there are undeniable limitations to the approach. Since most vapers heard about the poll over social media, companies who shared it with their fans likely had an advantage of those who didn’t, and those shortlisted from the beginning may also have had a slight advantage over those whose fans had to specifically write them in. However, e-liquid companies with more social media fans would be expected to have more vapers voting for them anyway (since it probably means they make good e-liquid), and any non-listed vendors could be written in to the “Other” field, so the poll still has a lot going for it. The point is that while making the top 20 best vape juice brands (or receiving any votes) is a big achievement for a company in such a crowded industry, the precise positions are less definitive, and may reflect bias in the poll rather than one vendor necessarily being more widely loved than another. We’re also working on a full count of all the vendors who received any votes from their customers, and we’ll publish that separately for anybody who’s interested. So, with that in mind, here are the top 20 best e-juice brands, as voted by you! Just making the top 20 best e-juice vendors, Castro’s Flavors is the new place to pick up e-liquids from Joe Castro, the “Joe” from FlavorZ by Joe. They’re all hand-crafted juices, and they span many flavor categories, including tobaccos, coffees and teas, sweet flavors, cereals and breakfasts, fruits, cakes and pies, custards and many more. Among his top-selling and best tasting e-liquid flavors are Moose Milk (cinnamon, honey and butter) and Unicorn Poop (a “tie-dye” fruit roll up). You also get a wide choice over PG/VG ratio (ranging from 20 to 70 percent VG) and plenty of options for nicotine. The e-liquid are currently priced at $8.99 for a 15 ml, $12.99 for a 30 ml bottle, $17.99 for a 50 ml bottle and $39.99 for a huge 135 ml bottle. Coming in at 20th place (tie with Castro's Flavors) is Jimmy the Juice Man, a Chicago-based vendor with a small selection of 7 vape juices that are all widely-loved by vapers. These include Caramel Pear, Crème Brulee, Shurb (raspberry, lime and orange – a vape-able rainbow sherbet) and Strawberry Astronaut (strawberry and apricot). Shurb is undoubtedly Jimmy’s most popular flavor, earning a spot on our best e-juice flavors list in its own right, but all of the juices are rated highly. They all come in a 60% VG, and a choice of 6 nicotine levels from 0 to 24 mg/ml (the 3 mg nicotine option is a max-VG blend, though). They’re currently priced at $18 for a 30 ml bottle, or $65 for a 120 ml bottle. Coming out on top of the three best e-liquid vendors originally tied for 18th place is Mt. Baker Vapor, one of the giants of the industry. Mt. Baker’s offerings are well-known, but they have an extensive collection, spanning beverages, fruits, desserts, nuts, spices, tobaccos, candies and even juices made by the monster-metal band GWAR. Hawk Sauce (sweet and sour berries with menthol), Thug Juice (berries and melon with menthol) and Moo Juice (strawberries and cream) are among their top-selling liquid vaporizer options, with each often being cited as the best vape juice from Mt. Baker, and you get the choice between 6 nicotine levels and 5 PG/VG ratios. A 15 ml bottle costs just $4.99, a 30ml bottle costs $7.49 and a giant 236ml bottle costs just $34.99. Space Jam E-Juice is another well-known and widely-loved vendor making our most popular e-juice list, with a stellar reputation with vapers and a range of nine vape juice flavors to choose from. Their juice vapors are broadly fruity and creamy, with flavors including Eclipse (a creamy vanilla tobacco), Pluto (melon, bubblegum and mint), Starship1 (kiwi and vanilla custard) and Andromeda (cream, pomegranate and blueberry). Andromeda is the original Space Jam flavor, and still ranks as the best e-liquid from the vendor for many vapers. Space Jam E-Juice comes in 15 ml bottles for $11.99 and 30 ml bottles for $21.99, with a choice of five nicotine levels (between 0 and 18 mg/ml) and a 50/50 PG/VG ratio. Pinup Vapors is a juice company based in St. Louis that pays homage to 50s pinup girls with the name of the brand and the individual vape juices. They have a range of five fruit and dessert juices, including the sweet fruity mixture Betty, the sweet, tart and fruity Lana and the vanilla custard, butterscotch and caramel Marilyn. All five Pinup Vapors juices are well-liked by vapers, but Betty is arguably the most popular. Pinup Vapors’ juices are all VG-heavy, with a PG/VG ratio of 25/75 for Marilyn and Betty, 80% VG for Victoria, 85% for Sophia and 95% VG Lana. The blends are all low nicotine, with 0, 3 and 6 mg/ml being the only options, and a 30 ml bottle will run you $22. Teleos is a unique e-liquid company, formed by two vapers over a thousand miles apart, focusing on innovative flavor combinations and being incredibly thorough to make sure only their very best vapor juice creations make the cut to go on general sale. They have 15 flavors in total, including Crunch (a Captain Crunchy recreation – cereal, berries, marshmallow and milk), Cloud Science Alpha (strawberries and spun sugar) and the Milk (fruit cereal and milk, with brown sugar and a few other choice ingredients). The PG/VG ratios vary – for example, Eight Bells is 50/50, the Milk is 70% VG and Cloud Science Beta is max VG – but they’re generally VG-heavy. Teleos juices cost $22 for a 30 ml bottle, and come in 3, 6 and 12 mg/ml nicotine, with 2.5 mg/ml and nicotine-free options available for some juices. Suicide Bunny needs little introduction, with the Texas-based mixer having a loyal following and Mother’s Milk being among many vapers’ favorite e-liquids. Taking the 14th spot in our best e-juice brands poll, Suicide Bunny offers five regular e-liquids, with the “Obsidian Edition” of Mother’s Milk being an aged edition of the original. Derailed is a snickerdoodle cookie, cinnamon and banana juice, the O.B. has a secret recipe but it’s a rich creamy e-liquid with many saying it tastes like a sweet cake, Sucker Punch is a fruit and cream blend, and Mother’s Milk is the classic strawberries-and-cream concoction, which many class as the best vape juice money can buy. Suicide Bunny e-liquids cost $22 per 30 ml, with between 0 and 18 mg/ml of nicotine (depending on where you pick them up) and a PG/VG ratio that’s unstated, but is usually given as 70% VG. Good Life Vapor is a Georgia-based mixer that got its start in 2012, putting out a selection of complex and delicious e-liquids that earned them a respectable spot on our top e-juice poll. With a range of 48 flavors on offer, Good Life Vapor offers plenty of choice in their e-cig juice with something for everyone’s tastes in the line-up but with a few particularly well-liked tobaccos. Among the many flavors is the strawberry gummy candy Zombie Blood, the watermelon bubblegum Gamma, the graham cracker, tobacco and cocoa El Kamino and the bakery backed tobacco blend Deadly Sin. The vape juices in the brand’s Signature and Virtu lines are 50/50, but the Nebbia Collection and Seduction line have 70% VG. They’re all available in six nicotine levels, from nicotine-free up to a maximum of 24 mg/ml (including 3 mg/ml). A 30 ml bottle will run you $15, but they’re available in sizes of between 10 and 100 ml ($6 to $35). Sicboy is a Colorado-based mixer offering a range of five e-liquids inspired by the creators’ favorite foods, and as well as earning a spot on the top 20 e-juice companies, they also scored two spots on our best e-liquid flavors top 10 for M.B.Y.C. and Deviant. Their aim is to make every flavor they have on offer an all-day-vape, and based on the feedback they’ve received they’ve done a pretty good job of it. The flavors most often called the best ejuice from Sicboy are the aforementioned M.B.Y.C. (a praline, vanilla ice cream and custard blend) and Deviant (cherry strudel with vanilla ice cream), along with Sicker Than Most (strawberry, blueberry, tangerine and cream) and Catatonic (a blueberry cheesecake with a cinnamon crumble base). The eliquids come in 65% VG and four nicotine levels, from nicotine-free up to 12 mg/ml. A 30 ml bottle of Sicboy e-liquid will cost you $19.99. Cyclops Vapor is an e-liquid vendor based out of Alabama, taking its name from the mythological creature (and the fact that one of the founders has just one functioning eye), they’re a vendor that takes care over every single blend and focuses on putting out a small number of high-quality juices rather than tons of so-so blends. Cyclops was the main casualty of the decision to switch to a top 20 and use a later vote-count: originally, they were in 7th place, so some may fairly argue that they deserve a higher spot. However, earning 11th place – and taking over 1/50 votes out of the plethora of vendors on the market – is still very admirable indeed. Among the six vape juices with names taken from deities, Cyclops Vapor has Colossus (a vanilla custard blend), Poseidon (melon and mixed fruit), Artemis (berry cobbler) and Athena (a green apple blend). The juices from Cyclops come in 65% VG, with six nicotine levels (from 0 to 24 mg/ml, including 3 mg/ml) to choose from. The juices are available in bottles ranging from 15 ml to 120 ml (for $7.99 to $49.99), with a 30 ml bottle costing $13.99. 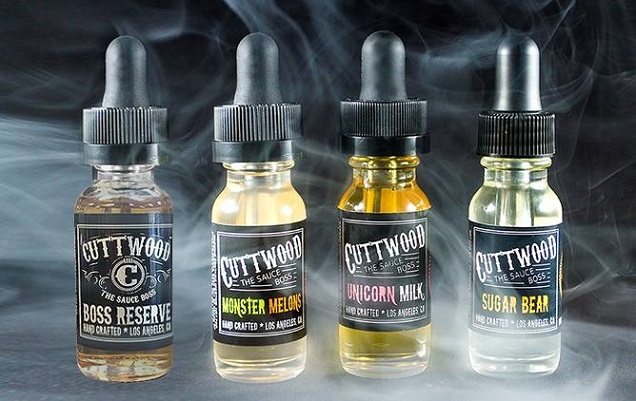 Cuttwood is an LA-based mixer that calls itself “the sauce boss,” with a range of five juices that have earned the mixer a loyal following and a spot on both our best e-liquid brands list and the best individual flavors – for their most famous blend, Unicorn Milk. They’re dedicated to quality, putting their vapor juices through rigorous testing and investing tons of time into research and development to ensure every one is as delicious and high-quality as possible. Cuttwood has five flavors on offer, the mango, cantaloupe and papaya Mega Melons, the honey, graham cracker, nut, banana and milk Boss Reserve, the fruit cereal Bird Brains, the cinnamon, cream and cereal option Sugar Bear and the strawberry and cream Unicorn Milk. The latter may be widely-considered the best vapor juice from the mixer, but each flavor they offer has it's staunch supporters. The PG/VG ratio of the juices isn’t stated, but they’re available in between 0 and 18 mg/ml of nicotine (depending on where you pick them up). The bottles are priced at $11.99 for 15 ml or $21.99 for 30 ml. Beantown Vapor is a Boston-based mixer, who’s been in the industry since 2010 but started focusing solely on putting out excellent vape juices a couple of years ago. They’ve earned 9th place on our top vapor e-liquid poll for their small-batch mixes and their range of 12 dessert-based, fruity and sweet juices. Among their offerings are Banana De Leche (caramel and banana), Oh-Face (strawberries and cream – this juice came second in our best e-juice flavors poll), Snozzberry (which tastes like Snozzberry, obviously – a melon and blue raspberry blend), Flesh and Bone (blueberry, peach and pastry) and Soul Custardy (a vanilla custard blend that took third place in the poll). The juices come in a PG/VG ratio of 33/67, with five nicotine levels available (ranging from 0 to 18 mg/ml, with a 3 mg/ml option). The bottles cost $17.99 for 30 ml and $60 for 120 ml. Smiley e Liquid is a California-based mixer whose juices first went on sale in 2014, with a range of fruity, savory and candy flavors and a dedication to quality. The mixer has eight flavors on offer, six through its standard line and two more Psycho X branded e-liquids, and comfortably placed within the top 10 e-liquid brands with over 2.5 percent of the total vote. The flavors from Smiley ordinarily have self-explanatory names and to-the-point flavors, including Apple Pie, Jolly Watermelon and Vanilla Dream, but the two Psycho X blends Drama Queen (strawberries and vanilla) and Jealousy (apple pie and caramel) break this mold. The juices come in a 50/50 PG/VG ratio or 70% VG, depending on the specific flavor, and are available in five nicotine levels from nicotine-free to 16 mg/ml. A 15 ml bottle costs $11.99. Dr. Crimmy’s V-Liquid is made by a retired veteran who started vaping in 2009 and has been developing his DIY mixing ability ever since. With a range of 66 e-juice flavors available, Dr. Crimmy earns a spot in our list with over 580 votes from vapers. The top e-liquid flavors available from Dr. Crimmy include Boston Cream Pie (chocolate, cream and custard), Crimm Brulee (Dr. Crimmy’s take on a crème brulee), Peanut Butter Cookie, Pineapple Upside Down Cake, Banana Caramel Crimm and many more. The juices all come in a choice of PG/VG ratios, from 50 to 80% VG, and 8 nicotine levels from 0 to 18 mg/ml. You also have the option of adding an extra flavor shot, if you want a more intense flavor. The juices cost $20 for 60 ml, $30 for 125 ml and $110 for 500 ml. Mitten Vapors is a Michigan-based vendor with a selection of 45 breakfast, dessert, drink, minty, fruity and candy flavors on offer. The mixer takes sixth place in our poll with almost 3 percent of the total vote. Among their huge selection of juices is #SinkingShip (banana, chocolate, peanut butter and cream), 3 Day Weekend (banana custard), Buddha’s Blend (coffee, butterscotch and Irish cream), Cast-A-Way (melon, strawberry, pear and peach) and Golden Bear (cinnamon, cheesecake and cookie). Their e-liquids are available in either 50/50 or max VG, with six nicotine level options from nicotine-free to 18 mg/ml (including 1.5 and 3 mg/ml) and with the option of one or two additional flavor shots. They’re priced from $2.99 (10 ml) to $25.95 (120 ml), with a 30 ml bottle costing just $7.99. The Indiana-based Casey Jones Mainline Reserve took fifth place in our poll by just one vote, with 13 juices on offer – including a pick-your-own yogurt blend – and reasonable prices across the board. Their e-liquid flavors include the creamy apple pie ‘Murica, the blueberry custard Bomb, the strawberry custard Derail, the fruity blend Forbidden and the creamy pastry and cocoa Massacre, with the vendor specializing in fruit and dessert-based e-liquids. The vapor juices from Casey Jones are available in five nicotine levels (from 0 to 18 mg/ml, including 3 mg/ml), with most flavors having 80% VG, aside from Two Cans (90% VG) and Pink Rabbit (85% VG). It costs $11.99 for a 30 ml bottle and $27.99 for 120 ml. Mech Sauce is based out of Virginia, and earns its spot on our list thanks to its extensive range of 47 e-juice flavors – priced pretty cheaply – and its solid following of vapers. It’s another vendor making this list that shows that a high quality e-juice doesn’t have to come with a “premium” price tag. Their most popular flavors include Mech Milk (strawberry milkshake), Antidote (strawberry shortcake ice cream), Captain Loopy (the milk left over after a bowl of Fruit Loops), Berry Sabotage (the same concept as Loopy but with Berry Captain Crunch) and Empress Milk (strawberry custard). The vendor offers plenty of options for PG/VG and nicotine, with a choice between 70, 80, 90 and max VG, as well as six nicotine levels from 0 to 18 mg/ml (including 3 and 9 mg/ml). 30 ml of Mech Sauce costs just $6.50, but prices range from $3.99 for 15 ml right through to $65.50 for 500 ml. The Steam Factory’s position of fourth place on our best vapor juice vendors poll marks the start of a sharp divide between the top rated juices and the rest, with the difference between 4th and 5th place being larger than that between 5th and 13th place. Needless to say, the Steam Factory has some strong support. The vendor got started in summer 2013, formed by a husband and wife team who set out to mix the ultimate all-day-vape, as well as looking to produce flavors that appeal to a wide range of vapers. They have five flavors on offer – Castaway (tropical fruits), Kismet (green apple and pear), Screwberry (mixed berries), Blue Ballz (banana and blueberry) and Muffcake (a half-muffin half-cupcake blend with lemon and mixed fruit), with Muffcake being the most widely-recommended of the bunch. The eliquids are available in the standard five nicotine levels from 0 to 18 mg/ml (with a 3 mg/ml option) and a 70% VG mix on most, but with Muffcake being a max VG blend. The juices cost $22 for a 30 ml bottle. Another huge step up in terms of votes puts Boosted E-Juice in a comfortable third place in our poll, with the Colorado-based mixer having rapidly gained a following since getting started in late 2013 to early 2014. Boosted has six premium e-juice flavors on offer: Intercooler (a cranberry, apple and cream blend), the seasonally-available Rear Diff (a pumpkin spice latte inspired blend), B.O.V. (peach, citrus, coconut and tropical fruits), Anti-Lag (strawberry, blueberry, watermelon and cream), Wastegate (raspberry cheesecake with vanilla ice cream) and the legendary Boosted (a creamy strawberry milkshake right out of a 50s-style diner). Boosted convincingly took the top spot in our best flavors poll, too. The juices from Boosted come in 60% VG, with the standard range of nicotine levels between 0 and 18 mg/ml (including 3 mg/ml). A 30 ml bottle will run you $19.99. A huge turnout puts Vape Wild comfortably towards the top of the pack, with just shy of 1,900 votes on the poll. Vape Wild is a Texas-based mixer with a focus on providing the best tasting e-juice for pretty cheap prices – or, as they’d put it, being damn good without being pretentious. They have a huge selection of almost 140 flavors, spanning breakfast blends, drinks, candies, desserts, fruits, menthols and tobaccos, with plenty of options in each category and some stand-out flavors in the bunch. Smurf Cake – a blueberry cheesecake blend – ranked 9th on our best flavors poll, but other favorites include (S + C)^2 (strawberries and cream), Fruit Hoops (the milk at the end of a bowl of fruit loops), On Cloud Custard (a vanilla custard blend), Sweet Complexity (cream, banana, cinnamon, sugar, vanilla and rum) and Circus Bear (strawberry, banana and custard). All of Vape Wild’s juices come in a choice of five PG/VG ratios (20%, 35%, 50%, 65% and 80+% VG) and eight nicotine levels ranging from 0 to 24 mg/ml. The price is pretty hard to beat, too, with 10 ml costing just $2.99, 30 ml just $6.99 and the biggest bottles available – a huge 480 ml – being just $59.99. Read our full Vape Wild review for more information. Black Note takes the top spot on our best vape juice brands list, having gained glowing reviews and praise from across the vaping community for their realistic, three-dimensional and deliciously complex tobacco blends. Black Note makes naturally extracted tobacco (NET) vape juice, which uses real tobacco leaves for flavoring. The leaves are steeped for six to eight weeks in PG and VG to give all of the flavor notes chance to infuse into the blend. This makes their line-up of six juices unbeatably authentic in taste, with all the depth and complexity of real tobacco coming through with every puff. Each flavor is a different variety of tobacco, with the Virginia tobacco Prelude, the Burley blend Forte, the sweetened, Cavendish offering Sonata, the robust Kentucky variety Legato, the Virginia and menthol combination Solo, and the Syrian Latakia blend Quartet. Vapers’ favorite flavors vary, but Prelude is particularly smooth and slightly sweet, while still offering a robust tobacco flavor, and Sonata is an outright masterpiece. For smokers looking for the most realistic tobacco flavor, Quartet is arguably the best of the bunch, but it’s a bit more expensive than the others at $39 per 30 ml bottle. The flavors all come in a 50/50 PG/VG ratio, and in five nicotine levels from 0 to 18 mg/ml, including a dripping-friendly 3 mg/ml option. The juices aren’t the cheapest on this list – with most at $29 per 30 ml bottle – but sometimes you have to pay a bit more for quality. And there’s no doubt you’re getting quality from Black Note. Check out our full Black Note review for more information. Those 20 vendors represent the best in the industry according to our poll of vapers, but it goes without saying that not everyone will agree on the vendors featured. So if you’re looking for some extra recommendations, we’ve put together a mini top-10 list of the best vape juice companies as chosen by the staff here at EcigaretteReviewed. The Milkman E-Liquid may only have a couple of juices on offer, but both of the options available are exceptional. The namesake e-liquid mixes fruit tart and vanilla ice cream (with some milk, of course), and Churrios is a churros e-liquid, with cinnamon sugar and nutty, honey-infused cereal milk: both are just as delicious as they sound, and come in high VG. A 30 ml bottle costs $18. Bombies is a well-loved mixer with a solid range of juices on offer, including several excellent fruity and sweet e-liquids. The banana, strawberry and berry concoction ‘Nana Cream is undoubtedly the most well-known of their flavors, but we also have a particular soft-spot for the sweetened tobacco blend A Real Nightmare. You can pick up 30 ml of Bombies juice for $14.99. Cosmic Fog is a very popular e-liquid brand with vapers, only slightly missing out on making the top 20 list based on our poll, but we’d definitely rank them among our favorites. Milk and Honey in particular is a fantastic marshmallow-based juice and a definite all-day-vape for us, but they also offer other unique flavors like the strawberry and ground almond butter Nutz. A 30 ml bottle of Cosmic Fog juice costs $21.95. Halo is an institution of the vaping industry, and their premium e-liquids have been loved by vapers for many years. For tobacco-lovers in particular there are some great options in Halo’s line-up, including the legendary RY4 blend Tribeca. Belgian Cocoa is another favorite for us, offering a rich, realistic chocolate vape. A 30 ml bottle of Halo juice will run you $19.99. Read our full Halo e-liquid review for more information. Mt. Baker Vapor made the top 20 list based on our poll, but we’d be remiss if we didn’t give them another mention here: they offer several juices that really knock it out of the park. They have a huge selection of juices on offer, so you'll undoubtedly be able to find several options well-suited to your tastes. Many vapers love Hawk Sauce, but for us Moo Juice is the undisputed king. Mt. Baker Vapor has great prices, too, just $7.49 for 30 ml. Mr. Good Vape earned some votes in our poll, but they’ve long been favorites here at EcigaretteReviewed. With some fantastic fruit and dessert-based juices in their line-up – including the apple pie, vanilla and cinnamon Dabble Dooyah and the sugar cookie, butterscotch and graham cracker Moon Sugar – we couldn’t let Mr. Good Vape go without a mention. You can get a 15 ml bottle for $11.99. The Vapor Chef is another great e-liquid brand that we’d class among our favorites in the industry, offering a wide range of flavors crafted by an ex professional chef, with the individual components to each flavor being artfully balanced. 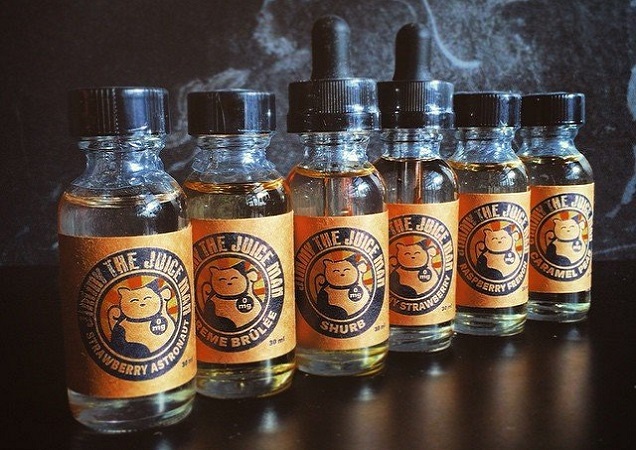 Our favorites are Honey Pearry and Shmuffer Shmutter, but there are many stand-out juices in the collection. A 30 ml bottle costs $19.99. VaporFi did pretty well in our best e-juice brands poll, but we’d specifically class the Reserve Collection as among our favorite juices. The collection features premium flavors, offering more complex and well-crafted blends such as the banana and custard Monkey Business and the melon berry and guava Northern Lights. The juices cost $19.99 for 30 ml. The Grand Reserve collection, which offers six even higher-end blends, is also available for pre-order. Read our full VaporFi e-liquid review for more information. Five Pawns is one of those mixers that every vaper knows, offering a consistently-delicious range of juices. They were close to making this list, but didn’t quite make the cut – although, like Black Note, they had a surge of votes not long after we’d officially counted up. We love most of their juices, but Castle Long and Grandmaster are particular favorites. A 30 ml bottle costs $27.50. Read our full Five Pawns review for more information. Black Note stormed into the top 10 e-liquid brands poll, but they got most of their votes after we’d officially counted up for this list. They’re a naturally-extracted tobacco mixer, focusing on realistic tobacco flavors that we think are unparalleled in the industry. Prelude is a smooth and mellow blend, but for us the Cavendish blend Sonata is a favorite. The juices cost $29 for 30 ml. Read our full Black Note review for more information. These companies represent some of the best e-juice vendors in the industry, but as we stressed earlier: our main list has a lot going for it, but it’s not the definitive “best of” for e-liquid companies, and it’s important to consider what you’re personally looking for in a vendor before you make a purchase. We’ll be adding to this post in the coming weeks with some tips for choosing a vendor, so check back soon! And finally, we want to say a big thank you to everyone who voted on our poll (which is still open for votes, if you want to see an even more up-to-date listing), and, most importantly, to thank all the vendors on this list (and those not on the list) for everything you do to make every day of vaping a pleasure for us all.